To date, the police refuses to liberate the girl, despite the repeated requests of the family. Mary Salik (fictitious name) was kidnapped last May 4 near Faisalabad by an uncle who had converted to Islam. The girl's father denounces conspiracy against his family: "My daughter has heart problems and was kidnapped by deception". Faisalabad (AsiaNews) - The family of Mary Salik (fictional name for security reasons) asks for justice for the 14 year old Christian girl, kidnapped last May 4 in Ali (Faisalabad, Punjab) and forced to convert to Islam. The author of the kidnapping is the uncle of the girl, who embraced Islam about a year ago and since then ended all contact with the family of origin. He kidnapped the young girl to marry her off with his son Kashif. The wedding was celebrated on 7 May. The girl's father, told AsiaNews that "my daughter is only 14 years old and suffers from the birth from heart problems and can not do heavy work. After converting my brother is conspiring against our family and kidnapped Mary with deception ". Immediately after the seizure, the father of the young Christian girl turned to local police and demanded the immediate release of his daughter, but the agents refused to return Mary to her family. According to police, the girl converted of her own free will and submitted as evidence a written statement in which the girl says to "be mature and have embraced Islam without coercion or threats." To get their daughter back, the parents decided to find a compromise with the help of some influential people in the area and have filed a petition against the police officers. Fr. Bonnie Mendes, priest and activist, former secretary of the Pakistan National Commission for Justice and Peace, speaks of the abuses suffered by the Christian community. "Although we are free to pray - he says - and to practice our religion, we are threatened when we try to defend our rights." The priest denounces the problem of cases of forced conversions to Islam of young Christians, which together with the blasphemy law is one of the most severe violations of religious freedom to the detriment of minorities. For Fr. Mendes Mary's case is against the teachings of Islam. In fact, those who want to convert require an iddat, a discernment period that must last at least three months. However, due to ignorance, illiteracy and social injustice, most Muslims do not observe this rule. Each month between 25 and 30 young girls suffer similar abuses, for a yearly total of about 300 conversions and forced marriages. Hindu girls - but also Christian - who are torn from the family while very young and delivered into the hands of their husbands / torturers. One case recently made headlines when the Pakistani Supreme Court forced three young Hindu women to return to their Muslim husbands, despite the desire of the young girls to return to their family. 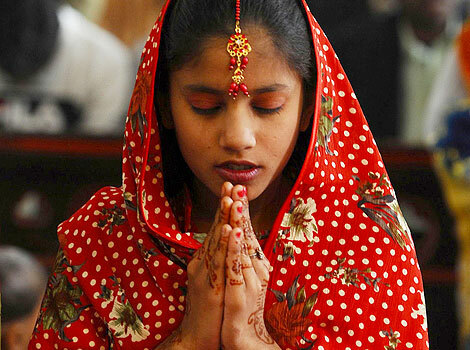 The young women were kidnapped in February, forced to convert to Islam and marry Muslim men. On March 26 Rinkle Kumari, one of the girls, told the judges of the Court that there "is no justice in this country only for Muslims, justice is denied Hindus. Kill me here, now, in court. But do not send me back to the Darul-Aman [Koranic school] ... they will kill us. " The other two young girls, Lata and Asha, had expressed, in vain, the desire to be reunited with their families.